Note: Also used to request a new PIN. 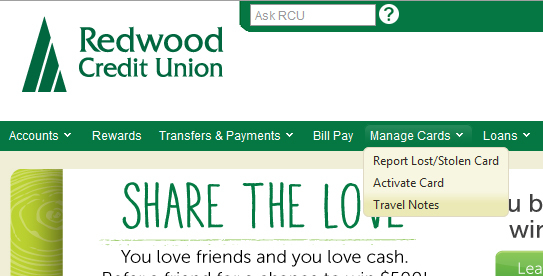 Login to RCU online banking and go to "Manage Cards" and select "Report Lost/Stolen Card" from the dropdown menu. Follow the instructions listed on the page. 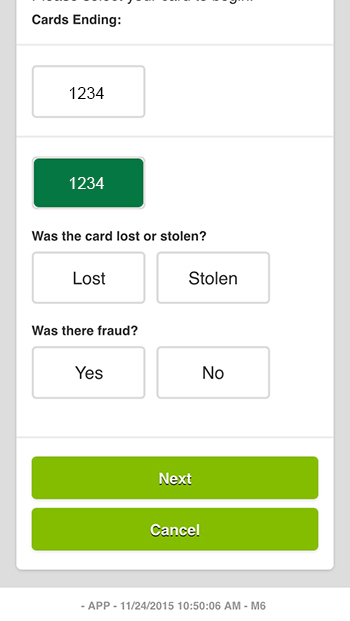 Select the card(s) you will be reporting lost or stolen. Was this card/card number Lost or Stolen? Please verify your information and submit your card cancellation. By completing this process, your card will be cancelled immediately. A confirmation email will be sent to the address we have on file with information about your new card and what to do if you suspect fraud. If your cancelled card is registered for Apple Pay, please be sure to delete it from your device and add your new card. Login to the RCU mobile app and open the main menu. 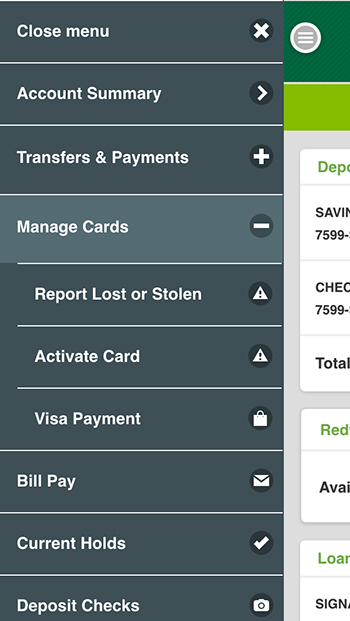 Select "Manage Cards" and choose "Report Lost or Stolen" from the dropdown menu. There are three steps to complete the card cancellation process. Follow the instructions listed within each step. 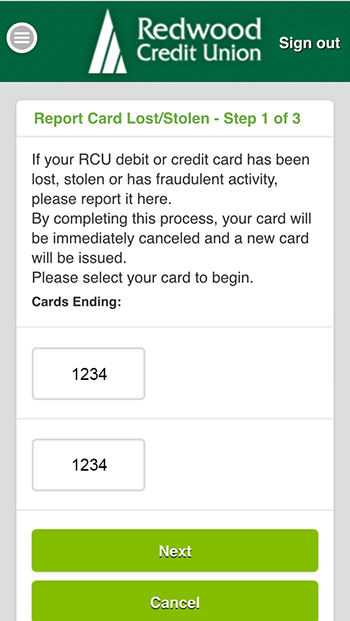 Step 1 - Select the card(s) you will be reporting lost or stolen. Was this card Lost or Stolen? Step 2 - Please verify your information and confirm your cancellation. 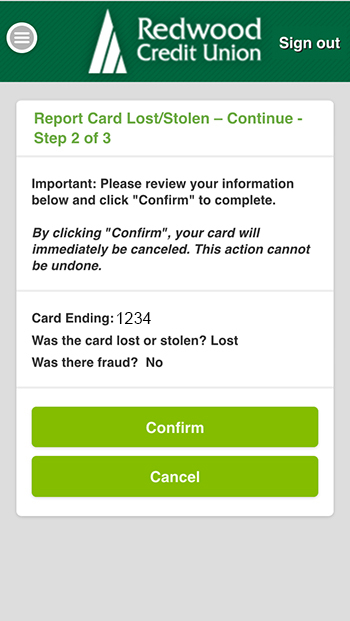 Step 3 - By completing this process, your card will be cancelled immediately. A confirmation email will be sent to the address we have on file with information about your new card and what to do if you suspect fraud. If your cancelled card is registered for Apple Pay, please be sure to delete it from your device and add your new card. Apple®, the Apple logo, and Apple Pay® are trademarks of Apple Inc., registered in the U.S. and other countries. What should I do if I receive notification that my credit or debit card has been compromised? How do I change my Credit/ATM/Debit card PIN? When will I receive my new Visa Debit Card? Is there a fee to have a debit card? How long does it take to reverse a fraudulent debit card charge? How do I report debit card fraud? How do I stop payment on a debit or credit card charge?